Give tired wall decor the boot and display your creative side with these hip and easy-to-make wall hangings. Tulip® One-Step Tie Dye™ offers a world of color for a creation that will run circles around your average framed art. Either follow the instructions on our iLoveToCreate project page or watch the featured video below! Pattiewack shows you step by step how to make these fun hula hoop creations! These look really great when layered together! They'd also make a fun headboard for a kids bed! Very cool! I am thinking that I could use wire hangers too! Liquid water colors, koolaid, mustard.... anything that would stain! Cool! If you looking to buy Tapestry online, do visit this website http://www.thenanodesigns.com offering range of Tapestries collections. Very cool! I just wanted to say that I really enjoyed this article. thanks for sharing with us. 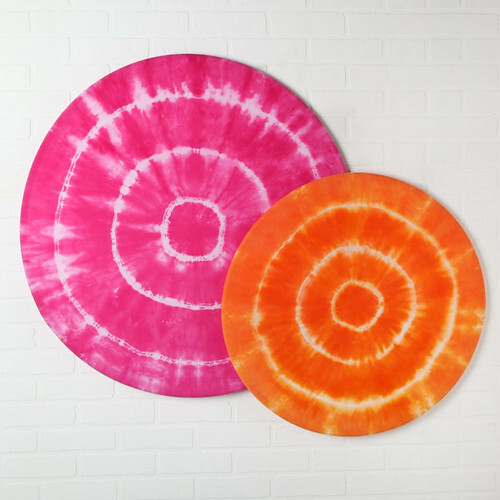 I recently purchases some beautiful tie dye tapestries from Fairdecor. Very cool! I just wanted to say that I really enjoyed your site and this post. Thanks for sharing such great blog with us. Nice post.... Wall hanging Tapestry is very beautiful for home decorative. thanks for sharing with us. Its simple and beauties tapestry. I found your post useful. Thanks for sharing with us. Nice article thanks for sharing !!!!! Awesome wall arts. It will look so good on my house's walls with my mandala tapestry.